Environmental citizenship, during which I explain my positions on public policy issues ranging from nuclear waste disposal to escaped emus. Cultural geology, emphasizing the science writings of Henry David Thoreau. Landscape Art, my interpretations as part of cultural geology, given at the Wadsworth Athaeneum in Hartford, CT, the Florence Griswold Museum in Old Lyme, CT, and the Newport Art Museum, in Newport RI. These talks, which average about seven hours each (travel, setup, presentation, Q&A, takedown, return travel), are given as my schedule and commitments allow, usually for a break-even honorarium. 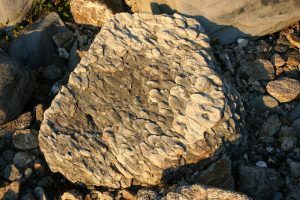 Photo: Permian Purgatory Puddingstone. The name alone invites a speech. I’ts a squash-pebble conglomerate in Narragansett Bay, RI formed by late Paleozoic mountain streams when New England had Himilayan proportions. I’ve always given talks to community organizations. I didn’t keep track of them until the Stone Wall Initiative went on line in the Fall 2004. For the next three years I kept track until I gave up, once again. Below I list a few years to give you a sense of the concentration and breadth of interest. Sept 10 – Hartford CT – Friday at 12:00 Noon Wadsworth Athaneum Gallery Talk on "Childe Hassam and Connecticut Impressionism. I will walk people through the exhibit and discuss the hidden geology in 14 of the 23 paintings in this exhibit. Contact Lee Oliver, Education Director, 860-278-2670. Sept 19 – Canton, MA- Sunday, mid-day. 11:00-2:00 Farm City Festival, Canton MA, sponsored by Hearts and Stars Bookstore (contact Joanne Blais: 781-856-3933). Demonstrations at 11:00 and 1:00 PM, followedby booksignings and discussion. Take I-93N/US-1 toward Braintee Cape Cod. Merge onto MA 138 via exit 2B towards Milton. Turn right onto blule hill river road. Signs from Exit 2B. Sept 21 – Stonington, CT – Tuesday evening at 7:00 Sponsored by the North Stonington Citizens Land Alliance, the North Stonington Garden Club, and the North Stonington Historical Society. Talk titled Stone Walls, History, and Culture, to be held at North Stonington Congregational Curch, located on Main Street, just off Route #2. Contact Betty Perkonski via email at perkowski@att.net. Sept 23 – Kingston, Rhode Island (URI Campus) – Thursday evening at 7:30 Dr. Mark Gould Memorial Lecture Series. Rhode Island Natural History Survey. Talk follows annual meeting. Preserving New England’s Heritage, Stone by Stone. Contact 401-874-5800 or email at infor@rinhs.org. Talk in Weaver Auditoriaum of the Coastal Institute on the URI Campus. Oct 3 – Sturbridge, MA – Sunday afternoon. Old Sturbridge Village, Made in Massachusetts (an all day fall festival). Informal lecture at 10:30-11:00 on stone walls, followed by a 1:00 walk to look at stone walls, followed by a booksigning at the bookstore at 3:00. Contact Anne-Marie Craven at 1-800-SEE-1830). Admission charge for the festival, but not for the signing/discussion. Many other authors artists will be there as well. Oct 10 – Block Island, RI – Sunday afternoon at 3:00 PM Annual Meeting of the Block Island Conservancy. Talk titled Stone Wall Conservation followed by discussion of efforts on Block Island. Saint Andrew’s Parish Center (on the island). Contact Doug Hoyt, President, 401-460-2493. Oct 13 – Enfield, CT – Wednesday evening at 7:00 PM. Meet the Author Series at Enfield Public Library. Stone by Stone, winner of the 2003 Connecticut Book Award (nonfiction). Contact: Assistant Director Mary Palomba at 860-763-7557. Located 1 mile south of 190 on Middle Road. Oct 15 – Stockbridge, MA – 7:00 PM. Berkshire Botannical Club. Registration required. Contact Elisabeth Carey, Education Director, 413-298-3926. Stone Wall Science. October 20 – West Hartford, CT – Wednesday Noon at 12:00. West Hartford Universalist Church, Fern Street. Luncheon program focussed on the spiritual aspects of the natural world that have influenced Professor Thorson. Nov 5 – Wallingford, CT – Friday morning at 11:00-12:30. Annual Meeting of the Connecticut Association of Land Surveyors. Technical session titled The Historic Landscape of Stone Walls. Mountainside Resort, Wallingford. Contact Rick Martel 860-291-8755. Open to the public, but registration required. Nov 5 – Wethersfield, CT – Evening, 6:30-7:00. Wethersfield Historical Society (Keeney Center), Opening of Geology Exhbit titled Connecticut Rocks.Thorson served on the design committee and is planning to be there to answer questions. Nov 7 – Dunstable, MA – Sunday Afternoon, 3:00-4:00. Nashua River Watershed Association. Free public lecture titled Stone by Stone: The Magnificent History in New England’s Stone Walls, given in the Dunstable Town Hall. Book signing to follow. Reception for donors/members after the talk. Nov 10 – Boston, MA – 6:30-8:30 Wednesday evening. The Arnold Arboretum of Harvard University sponsors a one-evening short course (HLP 252) titled Stone by Stone: A Look at New England’s Stone Walls. Registration required. $15 for members, $18 for non-members. Contact registrar at 617-524-1718 extension 162 or www.arboretum.harvard.edu. Just off Route 203 below intersection with Highway #1. Jamaica Plain. Nov 14 – Westport, CT – Sunday afternoon at 2:00 PM. Westport Public Library Author Series. Free public talk titled Stone by Stone. At Arnold Bernhard Plaza, 20 Jesup Road, Westport, CT, 06880. Contact Joan Hume, 203-291-4818. .
Dec 5 – Storrs, CT – Sunday afternooon at 3:00. Connecticut Archaeology Center, Connecticut State Museum of Natural History. Free public lecture titled Exploring Stone Walls, designed to introduce his new field guide. BSP (Biological Sciences and Physics Building) 130 on the UConn Campus. TBA- Storrs, CT – Late Afternoon. Publication party for Exploring Stone Walls: A Field Guide to New England’s Stone Walls, (New York, Walker & Company, 2005). Come join me for a few remarks, a few readings, and a little bit of how this project came together. Nibbles and signing to follow. Jan 7 – Willimantic, CT – 3:00 PM. Interview for local access television series on artists and authors. (Channel 44). Contact Maidie Cohen at m.cohen@uconn.edu, 487-1489. January 13- Storrs CT – Thursday morning at 10:30-12:00. Plenary session talk to the Society of American Foresters, Connecticut Chapter. University of Connecticut, Room 207 Young Building. Contact Dave Beers: battis@juno.com. Free with UCONN Id. January 13- Storrs CT – Thursday afternoon at 1:00- 2:30. Field walk to stone walls at UCONN Forest for the Society of American Foresters, Connecticut Chapter. University of Connecticut, Room 207 Young Building. Contact Dave Beers: battis@juno.com. Feb 2- Glastonbury, CT – Wednesday evening at 7:00. Lecture in Earth Detective series by Connecticut Audubon Society. Contact Judy Harper. Feb 15- West Hartford, CT – Tuesday, 8:00 AM – 2:00 PM. Annual Stroud Science Symposium at Kingswood Oxford School. Climate Change Science. Feb 16- Storrs, CT – Wednesday afternoon at 4:30 PM. Publication Party for Exploring Stone Walls. Remarks, readings, and color slide show followed by a signing. Sponsored by the UConn Co-Op Bookstore. Susan Staubauch. Mar 5 – Middletown, CT – Saturday morning at 10:30. Talk at annual meeting of Christmas Tree Growers of Connecicut. Mar 7- Storrs, CT – Monday afternoon at 3:15-4:15. Talk on the Connecticut Landscape and Climate Change. A session for the Center for Learning in Retirement at the Depot Campus of the University of Connecticut. Mar 12 – New Britain, CT – All Day. Keynote speech at 10:00 AM in Auditorium followed by, signings, and workshops for annual meeting of the Connecticut Science Teachers Association and Connecticut Science Educators Professional Development Day. Contact Ray Delehant, Conference Chair and Vice President of Connecticut Science Teachers Association, 203, 230-2813. March 15 – Brooklyn, CT – Evening Talk. Annual Meeting of the Eastern Connecticut Forest and Landowners Association. Contact David Scroeder, Head, Dept. of Natural Resource Management and Engineering, UCONN. Mar 19 – Bristol, RI – Saturday morning field trip at 10:00-11:00. Lecture on Exploring Stone Walls at Blithewold Mansion, Gardens, and Arboretum. Contact Marion Murray, interpretive horticulturalist, mmurray@blithewold.org, 401-253-2727 ext. 16. March 21 – Boston MA – Tuesday Evening, 5:00-9:30. Private Meeting for Blue Hills Neighborhood Association for Stone Wall Management. March 23 – South Windsor – Wednesday Afternoon, 2:45-4:04. Connecticut Academy of Science and Engineering: Talk to middle school students about geology and geological hazards. Mar 28 – Wethersfield, CT – Monday evening at 6:30 signing, 7:00 talk. Public Lecture on Connecticut Geology and Stone Walls at the Historical Society’s Cheny Hall on their new geology exhibit, Connecticut Rocks. Contact Melissa Sirick weth.hist.cociety@snet.net. March 29 – Cheshire, CT – Tuesday Evening at 7:30. Public lecture on historic mines, stone walls, and the rural industrial landscape. To be held at the Senior Center. Contact Gail Collins, 203-271-2841). March 31 – Windsor, CT – Thursday afternoon at 2:45-3:45. Connecticut Academy of Science and Engineering: Talk to middle school students about geology and geological hazards. April 2 – Ashby, MA – Saturday afternoon. Annual Meeting of the Ashby Land Trust. Meetinig at First Parish Church on route 119. 10:00 AM meeting, 11:00 talk. Apr 4 – New Haven, CT – Monday evening at 6:20-8:00. Ticketed lecture titled "A Brief History of Time…as Told Through New England’s Stone Walls" to Friends of the Peabody Museum. Contact Melanie Brigockas at melanie.brigockas@yale.edu. April 13 – Greenwich, CT – Wednesday afternoon and evening. 2:00-9:00 AM. Classrom visits, teacher’s workshop, and evening presentation to students/parents of the Greenwich Public Schools. Venue is at ALP Program, Riveride School. Contact Vicky Koudstaal, 203, 637-4081, vicky_koudstaal@greenwich.k12.ct.us. Evening lecture at 7:00 PM. Apr 17 – Storrs, CT – Sunday afternoon at 2:00-5:00. Keynote speech on science journalism and stonewalls. annual meeting Phi Beta Kappa society. University of Connecticut, Chemistry Building, Auditorium (120-A). Contact Kathryn Stother Ratcliff, 860-486-0087, national scholarships@uconn.edu. Apr 18 – Tolland, CT – Monday evening 6:30. Lecture on stone wall conservation at Tolland Public Library. Contact Nancy Brochu at 860-872-2613. Apr 21 – Providence, RI – Thursday evening at 7:00. Talk on Exploring Stone Walls, Annual general membership meeting of the Rhode Island Society of Professional Land Surveyors.Contact David Hilbern, President, dhilbern@wmconnect.com. Apr 24 – Brookfield, MA- Sunday afternoon at 3:00-4:30. Public lecture at annual meeting of the Quaboag Historical Society, preceded by luncheon meeting at 12:30. Contact Marguerite M. Geis at mlmerr@mail.ccsinet.net. Apr 30 – Sandisfield, MA – Saturday Morning at 10:30. Public lecture at Snow Farm, for Trustees of Reservations, followed by signing. Contact Wendy Sweetswer, 413-268-8219. Apr 30 – Sandisfield, MA – Saturday afternoon at 1:00. Field trip/nature walk to stone walls at Snow Farm, Trustees of Reservations, preceded by signing. Contact Wendy Sweetser 413-268-8219 wsweetser@ttor.org. May 11, Guildford, CT – Wednesday Evening, 7:30-9:30. Connecticut Audubon Society, Meanunkatuck Chapter (Madison, Guilford, New Haven, & ?). Greene Community Center. May 12 – West Hartford, CT – Thursday Evening after dinner 7:30 PM. Sierra Club, Greater Hartford Chapter. Global Warming and Climate Change – Some New perspectives.Presentation, Discussion and Book Signing. (Prof. Thorson will bring copies of his three books (Stone by Stone, Exploring Stone Walls, and Stone Wall Secrets) which he will sign and inscribe. Contact Rich Stanley 860-651-8157. May 16 – Orange, CT – Monday evening at 7:30. Stone Walls of New England. Friends of the Orange Public Library (Orange Center, near Tyler City Road). Lecture Series. Contact 203-795-4444. May 18 – Hebron, CT – Wednesday Evening, 7:30-9:00. Hebron Historical Society. Lecture on Stone Walls. Held in Douglas Library (Just northeast of junction of rte 66 and 85) Contact 860 228 4647. May 31 – Littleton, MA, -Tuesday Evening 6:00-10:00 PM. Dr. Ed. Burns Forum (and endowed lecture series of the Littleton Land Trust), co-sponsored by the Freedom Way (a coalition of towns), 55 King Street, Littleton Ma (Public High School). Contact Don McKiver, 978-952-2706. June 2 – Farmington, CT – Thursday evening, 6:30 PM Wine and Cheese and Talk at 7:00. Sponsored by Stanley Whitman House and Museum, with cosponsorship by the Farmington Land Trust. Talk will be held in Community Room at Farmington Main Library (Monteeith Drive). Free Lecture titled Exploring Stone Walls. Contact Lisa Johnson 860-677-9222. Books will be available for sale by Mill Race Bookshops at the event. June 5 – Rocky Hill, CT – Sunday Afternoon 1:00-2:00. Friends of Dinosaur State Park and Arboretum: Stone Walls of the Connecticut River Valley. Free with membership of the Friends or with admission to museum ($5 adults, $2 kids 6-17). $2 for lecture only. Michael Soares 860-529-5816. June 9 – Brunswick, ME – Bowdoin College Thursday morning. 9:15-10:30. Plenary session talk Stone By Stone. Kickoff for all day-long symposium on stone in the landscape to be held in Bowdoin College’s Kresge Auditorium (Visual Arts Building) Sponsored byCoastal Maine Botanical Gardens. Contact John Manion, Director of Eduation, 207-633-4333, http://www.mainegardens.org, jmanioin@mainegardens.org. Registration fee required. June 10 – Boothbay Harbor, ME – Friday afternoon 1:00-3:30 PM.. Walk/tour of stone walls at Coastal Maine Botanical Gardens. A Walk with Robert Thorson: the natural and cultural history of the stone walls and other geology of coastal maine botanical gardens. Contact John Manion, Director of Eduation, 207-633-4333, http://www.mainegardens.org, jmanioin@mainegardens.org. $15 member, $20 non-menbers. Limited to first 20 people. June 11 – Coventry Connecticut – Saturday Afternoon at 4:30. 250th birthday celebration for Nathan Hale. Events Homestead. Walk and tour titled Sleuthing Stone Walls: Squeezing Local History from Stones. sponsored by Atiquarian and Landmarks Association. Events are free, but a $4 donation per adult is requested, with events all day long from 10:00 AM on. Sept 11 – South Shaftsbury, Vermont — Sunday Afternoon 2:00-4:00 PM. Robert Frost Stone House Museum. Lecture, Readings, Field Trip, and Book-signing . Funded by the Vermont Humanities Council. Carole Johnson, coordinator. Sept 15 – Madison, CT — Thursday evening at 7:30-9:30 PM. R. J. Julia Booksellers. Lecture, Reading, and Signing. Contact Laura Hill, Events Coordinator. 203-245-3959. September 18 — North Granby, CT — Sunday Afternoon 12:00-3:00. Granby Land Trust. Picnic, lecture, field trip, and signing. Rick Orluk, coordinator, 860-674-1770. September 30 — Sturbridge, MA — Monday afternoon, 1:00-3:00. Massachusetts Association of Land Lurveyors and Civil Engineers. Auditorium Talk; walls as boundaries. Dan Bremsmer, 978-771-5879. October 1 — Storrs, CT — Saturday Morning 11:00 PM. UCONN Family Weekend. A Curious College Metaphhor (Armored Mud Balls). October 2 — Coventry Connecticut – Sunday Morning; 10:00 AM. Friends of the Office of State Archaeologist. Nathan Hale Homestead. Field trip for exploring Stone Walls. October 7 — Hampton, CT – Friday Morning; 10:00 AM. Walking Weekends. Field Walk for Exploring Stone Walls. October 10 – Hanover, NH – Monday afternoon 1:00-3:00. Dartmouth College ILEAD Program, Lecture in Hanover Inn, Hanover, NH. October 10, Hanover, NH – Monday afternoon 3:30-5:30. Dartmouth Bookstore. Signing and Discussion. Tuesday, October 18 — Farmington, CT — 4:30 PM. Annual Meeting of Hill-Stead Museum. Speech on the Stone Walls of Hillstead.Contact the museum. Thursday, October 20 — Hartford CT — 5:00 PM. National Science Teachers Association Annual Convention. Talk: The Science of Stone Walls. See program for room and access. 5:00 at the Hartford Mariott. Wednesday, October 26 — New Milford, CT — 7:30 PM. New Milford Public Lilbrary. The Who, What, When, and Why of Stone Walls. Friday, October 28 — New London, CT — 1-5 PM. Connecticut College Arboretum: Field meeting and discussion with staff and students on stone wall taxonomy. Friday, October 28 — Salem, CT — 7:00 PM. Salem Land Trust. Presentation on Exploring Stone Walls. Wednesday, November 2 — Norwell, MA — 7:00 PM. South Shore Nature Center. Talk on Exploring Stone Walls. Monday, November 7 — Poultney, VT — 11:00 AM. Green Mountain College. Talk to capstone course for general education course on the delicate balance. Sunday, December 11 – Chester, CT – Evening. Chester Land Trust Annual Meeting. Talk: Stone Wall Conservation. Contact information to be posted later. March 10 – Ashford, CT – Friday evening at 7:00-9:00 PM. Ashford Public Library – Talk on Stone Walls. Contact Jean Jacobski. March 23, Hallowell, Maine – Thursday evening at 7:00. Kennebec Lyceum and Land Trust. Evening Lyceum talk. at Vaughn Homestead. Contact Theresa, 207, 377-2848. March 25 – Storrs, CT – Saturday afternoon at 1:00. Joshua’s Trust. Guided walk through the Moss Sanctuary. Group will meet at Mansfield Rec Center, across t he street from the Moss Sanctuary. Contact Marge Manfred. March 29 – Sturbridge, MA. Opacum Land Trust located in Sturbridge, MA. Annual Meeting at TJ O’Briens Restaurant & Pub in Sturbridge, on March 29th, from about 6:30-9pm. Contact Carol Childress 508-347-9114. April 9 – Burlington, CT — Sunday afternoon. Burlington Public Library talk. April 11 – Storrs, CT – Tuesday afternoon at 4:30. Connecticut Academy of Arts and Sciences. Talk on time-travel with stone walls.Contact Bruce Stave. April 15 – Cornwall, CT – Saturday afternoon at 3:00. Cornwall Historical Society. Contact Ann Schillinger. April 17 – Dudley, MA – Afternoon. Nichols College. Policy. Contact Len Harmon. April 23 — Lyme, CT – Sunday afternoon at 1:00-2:30 PM. Lyme Public Hall and Lyme Land Trust . Talk, and signing. Contact Wendy Hill. April 23 — Lyme, CT – Sunday afternoon at 3:00-5:00 PM. Lyme Public Hall and Lyme Land Trust . Guided Walk. Contact Wendy Hill. April 24 — Wethersfield, CT — Monday evening at 7:00. Wethersfield Historical Society and Museum. Presentation on Thinking Like a Planet, which is principally about writing an earth-centered newspaper column. April 29 – Storrs CT – Saturday morning. Connecticut State Museum of Natural History. Guided Walk/workshop on stone wall interpretation. Registration required Contact Cheri Collins at the museum. April 30 – Madison, CT – Sunday morning. Shoreline Unitarian Universalist Meetinghouse. – A sense of the earth. Talk as part of sunday service. Contact Harry Mangle. May 6 – Bristol, RI – Saturday Morning at 10:00 -2:00 (Tentative). Blithewold Mansion And Gardens. Lecture at 10:00 followed by signing followed by guided walk of the grounds. Contace Marion Murray. May 9 — Lebanon, CT – Tuesday evening at 7:00. Lebanon Public Library Public Lecture. Contact Julie Culp 860-642-0763. May 11 – Farmington, CT – Thursday morning. Office of the State Archaeologist. Field Trip to Hospital Rock as part of heritage nomination process. May 30 – New Milford, CT – Tuesday Morning. New Milford Public Schools. Workshop for elementary students. June 3 – Sturbridge, MA – Tentatively Saturday morning. Old Sturbridge Village details to be arranged. June 9 – New London, CT – Friday evening. Connecticut College Arboretum. Annual Trustees/members dinner and reception. 7:00 – 9:00 PM. Talk on Stone Walls with special reference to Human Ecology. June 10 – Bolton, CT – Saturday Afternoon. (Sponsored by Bolton Land Trust ) Rain Date June 11.. Public Lecture at 1:00 PM on Stone Wall Heritage to be held at the in Congregational Church, Bolton Center. Requires re-registration by calling Gwen Marion at 860-643-9302. Book signing and Q & A to follow. June 10 – Bolton, CT – Saturday Afternoon. (Sponsored by Bolton Land Trust ) Rain Date June 11. Walk of Rose Farm at 2:30 PM on Stone Walls of Bolton. Departure point with parking is the Congregational Church, Bolton Center. Contact Gwen Marion at 860-643-9302 for details. Will be preceded by Book signing. June 27 – New Haven CT – Tuesday. Yale University, Peabody Museum Teacher’s Workshop. Registration full. August 20 – Hallowell, ME Sunday Afternoon/evening. Annual meeting of Kennebec Land Trust – Guided Walk. Contact Theresa at 207-377-2848. September 9 – Montery, Massachusetts (Berkshires) — Saturday Morning, 10:00-1:00. Bidwell House and Museum. Presentation, Booksigning, and walk. Conact 413-884-5698. September 19 — Bethel, Connecticut (Litchfield Hills) — Tuesday Afternoon at 3:00-5:00. Master Gardener’s Course, UConn Cooperative Extension Service, Fairfield County. Contact Sandra Wiilson. September 24 – Derry, New Hampshire — Sunday afternoon at 2:00-4:00. Robert Frost Museum and Farm. Talk on Robert Frost and Stone Walls, followed by signing and walk. Contact Claire at 603-432-3091. October 12 — Waterford, Connecticut — Thursday evening at 7:00. Borders Books. Opening event for Educators weekend. A brief talk followed by discussion. Contact Jill Selwell 86-444-1052 or the store at 860-442-3366 915 Hartford Tpke, Waterford, CT 06385. October 17 — Plainville, Connecticut — Tuesday evening at 7:00-9:00 PM. Plainville, CT Historical Society, Town Hall Museum. Stone Wall Talk for Annual Meeting. Contact Sylvia Millerick 860-348-1119. October 18 — Union, Connecticut — Wednesday Morning 10:30-12:00. Union Senior Center. Talk on Stone Walls. Contact Sheila Roberts, 860-684-3520. October 18 –Naugatuck, Connecticut – Wednesday Evening, 8:00 PM Talk.. Annual meeting of Naugatuck Historical Society. Talk on Stone Wall Heritage. Cocktails at 6:00, Dinner at 7:00, and Talk at 8:00. Contact Sandra Clark at 203-729-6466. October 22 — Princeton, Massachusetts — Sunday afternoon 3:00 PM. Princeton Land Trust and Historical Society – Stone Wall Heritage. Historical Society Building, Princeton, MA. Contact Susan Schlaikjer. November 1 – West Hartford Connecticut – Wednesday afternoon 12:45-1:45. University of Connecticut Regional Campus, Community Forum, Slouching Towards Journalism: The Conflicts Between Science and Opinion Writing. Brief presentation and discussion. Contact Beverly Manning 860-570-9031. November 13 — Mystic, Connecticut (Marriott Hotel) — 9:00 AM Monday Opening session. Northeastern ARC (Geograhic Information Systems). Keynote speech for annual meeting. Contoact Gina Torres, Gina M. Torres – CT NEARC Host Chair, CAD/GIS Technician, Town of Groton DPW, 134 Groton Long Point Rd., Groton, CT 06340-4873 ph: (860) 448-4070. On Sabbatical, very few Talks. September 11 – Willington, CT – Tuesday Evening at 7:30 Willington, Ashford, and Tolland Historical Societies. Combined talk on Stone Walls of the Northeastern Highlands. New Public Library at junction of Route #74 and #320. Contact Michael Emmons. September 22 – Prudence Island, Rhode Island – Saturday Afternoon (details to follow) In the first Maramas Memorial Lecture, Professor Robert M. Thorson will provide a background talk on New England Walls, then zoom in on Rhode Island, then zoom in even more to Prudence Island. Each wall is a message about environmental history written in stone. Contact Rosmary Maramas 401-682-2303 . Talk at Hope Brown Center, Farnham Farm, Prudence Island. September 27– Salem, CT – Thursday evening at 7:30. Salem Public Library (Friends of LIbrary). Lecture on stone wall landscapes at Salem Public LIbrary. Contact CarlyBilly@aol.com. October 9 – Colchester, CT – Tuesday Evening at 7:00. Colchester Historical Society and Colchester Land Trust. Contact Gigi Liverant, Program Chair, historiccolchester@sbcglobal.net Details to Follow. Talk at Colchester Public Library? TITLE: Stone Walls. Why Bother? Because Later is too Late. October 10 – Litchfield, CT – Wednesday Evening at 7:00. Environmental History of Northwest Connecticut Speaker Series. Sponsored by the White Memorial Conservation Center. Lecture Series. Presentation titled Stone Walls as Indicators of what was here before and what they have become. Contact James Fischer at 860-486-0857. October 20 – Watertown, CT – Saturday at Noon. Watertown Historical Society Museum. Talk at noon followed by signing and a short hike on a nearby land trust. Location is Walker Hall, 50 Deforest Street, which is essentially the intersection of Route 6 and 63 in Watertown. Contact Stephen Bartkus, curator at 860-274-1050. October 16 (not given; mixup) –Groton, CT – Tuesday Evening at 7:30-9:30. American Experience Lecture Series, University of Connecticut, Avery Point, Groton, CT. Co-sponsored by the New London Historical Society. Presentation titled: Stone Walling the American Experience. Talk is in room 103 of the Marine Science Building at the Avery Point Campus. Contact Matthew McKenzie (UCONN 860-405-9270) or Edward Baker, Executive Director of the New London Historical Society (860-443-1209). March 11 – Glastonbury, CT – Tuesday, 9:30-10:30.. Glastonbury High School: Current Issues Forum Talk/discussion on the Anthropocene, Global Population,and Human Impact. Contact John Murdoch. March 20 – Dudley, MA – Thursday evening at 7:00. Black Tavern Historical Society. Presentation and discussion of New England stone walls. Bring your favorite stories and questions. Meeting at Black Tavern Inn, 138 Center Road (Route 197 west), Dudley, MA. Contact Sandy Peterson 508-949-2468. March 27 – New Canaan, CT – Thursday 12:00-7:30 PM. The Glass House (by architect Phillip Johnson). With master mason Mark Mendell. Orientation for House Guides, 2008. . Lecture, signing and field trip. For Guides Only. Not open to the public. March 29 – Putnam, CT – Saturday, 2:00-3:30 PM. Putnam Public Library. Free Public Lecture titled Stone Walls with Robert Thorson. 225 Kennedy Drive, Puntnam, Connecticut. Contact: Brigit Larsen/Trish Jensen. April 8 – Storrs, CT – Tuesday Afternoon at 12:30-1:45 PM. University of Connecticut: presentation in course on North American Archaeology: Taxonomy of the Stone Domain:. Contact Kevin McBride, instructor. April 10 – South Kingston, RI – Thursday Afternoon 3:00 PM. Presentation to Senior Housing Project. Contact: Susan Courneyer 401-787-8779. April 12 – Chesterfield, MA – Saturday 1:00-3:00 PM. Trustees of Reservations: Talk/Signing & field Walk. Contact: Mark Wamsley 413-268-8219. April 16 – Stoughton, MA – Wednesday evening at 7:00 PM. Stoughton (MA) Historical Society, Moose Hill Audubon Sanctuary, Trustees of Reservations, and Massachusetts Dept. of Conservation and Recreation: Public lecture on Stone by Stone, discussion, signing. Please see information below, copied from the Stoughton Historical Society Newsletter V XXXVII, NO. 3. May 22 – Westfield, MA – Thursday Evening. Windy River Land Conservancy Annual Banquet; Contact: Mary Elizabeth Marten. Though the list ends, the talks kept going.